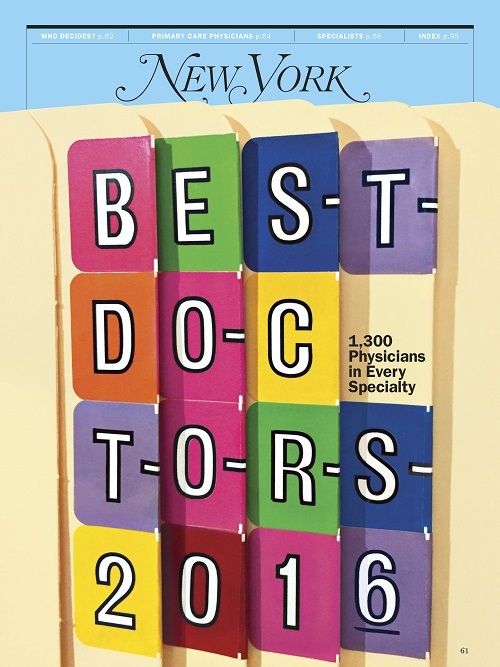 August 5, 2016 – In this year’s New York magazine “Best Doctors” issue, physicians on staff at Englewood Hospital and Medical Center were recognized as among the best doctors in the New York metro area. The magazine joined with Castle Connolly, one of the nation’s leading medical research and rating firms, to select the top doctors through a peer nomination process. Additional physicians named a New York magazine “Best Doctor” included those with expertise in heart and vascular, cancer, gastroenterology, pediatrics, geriatric medicine, pain, colorectal surgery, urology, and neurosurgery, among others. Several New Jersey publications also ranked top doctors. Among the New Jersey physicians listed in (201) Health magazine’s 2016 “Bergen’s Top Doctors,” 33 percent were affiliated with Englewood Hospital, including 15 physician leaders in a variety of specialties including neurosurgery, gastroenterology, cancer, heart and vascular, and emergency medicine. The research, provided by MSP Communications, a leading researcher and publisher of “Super Doctors,” identified top doctors in 45 specialties. New Jersey Monthly magazine’s latest “Top Doctors” rankings from 2015 recognized physicians on staff at Englewood Hospital with expertise in pediatrics, gastroenterology, heart and vascular, neurosurgery, and colorectal surgery, among others. The publication partnered with Leflein Associates, a NJ-based research firm, to select top doctors through a peer nomination process. Additionally, the Star Ledger’s Inside Jersey magazine, which also partnered with Castle Connolly, recognized 105 physicians on staff at Englewood Hospital and Medical Center in its latest rankings. Physicians with expertise in neonatal-perinatal medicine, neurological surgery, gastroenterology, heart and vascular, geriatric medicine, orthopedic surgery, maternal and fetal medicine, colorectal surgery, psychiatry, and cancer appeared in the publication’s Top Doctors, Top Doctors for Women’s Health, Top Doctors for Children’s Health, and Top Doctors for Cancer Care issues.